Leinster Final Ticket Order Details! Congrats Carla and Oonagh All Ireland Champions! 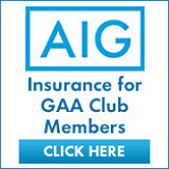 Dublin V Kildare Leinster Semi Final Ticket order details! No winner of this weeks Lucky Dip. Numbers drawn 22,27,34,35. Jackpot is now â¬870. Men's Championship gets under way this Friday!! No winner of this weeks Lucky Dip. Numbers drawn 3,6,7,17. Next weeks Jackpot is now â¬4010.